Our peppermint flavored gel removes plaque and tartar from your pet's teeth-no toothbrush required. Made with all-natural, holistic ingredients, Oral Care Gel safely removes plaque and tartar, reverses oral disease, promotes healthy gums, brightens teeth and kills the bacteria that causes bad breath. The ingredients mix with your pet's saliva when applied on your pet's teeth and completely coats your pet's teeth and mouth. This process kills harmful bacteria and loosens plaque and tarter. Safe for cats and dogs of all breeds. Start your pet on the road to better oral health today. Made in the USA. Vetzlife Oral Care Gel is a professional strength formula with 100% natural ingredients that help maintain healthy gums and teeth. A powerful combination of herbal extracts and essential oils that provide defense against bacteria that cause gingivitis, plaque and tartar. Eliminates bad breath. Use according your veterinarian's direction. Our peppermint flavored spray removes plaque and tartar from your pet's teeth--no toothbrush required! Made with all-natural, holistic ingredients, Oral Care Spray safely removes plaque and tartar, reverses oral disease, promotes healthy gums, brightens teeth and kills the bacteria that causes bad breath. When sprayed in your pet's mouth, the ingredients mix with your pet's saliva and completely coat their teeth and mouth. 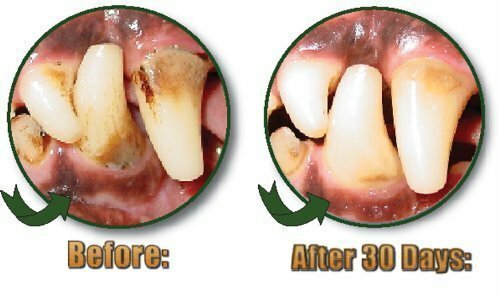 This process kills harmful bacteria and loosens plaque and tarter. Safe for both cats and dogs of all breeds. Made in the USA. 100-percent natural, uniquely formulated with l-theanine, a naturally occurring amino acid in green tea that helps promote a restful relaxed state without causing reduced alertness. Relieves stress and anxiety in pets. Easy to use, simply apply directly or mix with food or a favorite treat. For best results use 30 minutes prior to stress-inducing events. Great for thunderstorms, fireworks, separation anxiety, car rides, and visits to the groomer or vet. Directions; cats 1/4 teaspoon twice a day, dogs under 25-pound 1/4 teaspoon twice a day; 26-50-pound 1/2 teaspoon twice a day; 51-75-pound 3/4 teaspoon twice a day and Over 75-pound 1 teaspoon twice a day. Active ingredients; l-theanine 100-mg 1/2 teaspoon, thiamine, niacin, coenzyme q-10, extracts of green tea, white tea and chamomile in purified water gel. 4-ounce a bottle. 100-percent natural, uniquely formulated with l-theanine, a naturally occurring amino acid in green tea that helps promote a restful relaxed state without causing reduced alertness. Relieves stress and anxiety in pets. Easy to use, simply apply directly or mix with food or a favorite treat. For best results use 30 minutes prior to stress-inducing events. Great for thunderstorms, fireworks, separation anxiety, car rides, and visits to the groomer or vet. Directions; cats 1/4 teaspoon twice a day, dogs under 25-pound 1/4 teaspoon twice a day; 26-50-pound 1/2 teaspoon twice a day; 51-75-pound 3/4 teaspoon twice a day and Over 75-pound 1 teaspoon twice a day. Active ingredients; l-theanine 100-mg 1/2 teaspoon, thiamine, niacin, coenzyme q-10, extracts of green tea, white tea and chamomile in purified water gel. 12-ounce a bottle. 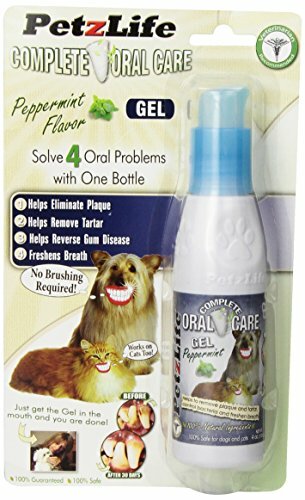 Our peppermint flavored gel removes plaque and tartar from your pet's teeth--no toothbrush required! Made with all-natural, holistic ingredients, Oral Care Gel safely removes plaque and tartar, reverses oral disease, promotes healthy gums, brightens teeth and kills the bacteria that causes bad breath. The ingredients mix with your pet's saliva when applied on your pet's teeth and completely coats your pet's teeth and mouth. This process kills harmful bacteria and loosens plaque and tarter. Safe for cats and dogs of all breeds. Start your pet on the road to better oral health today. Made in the USA. 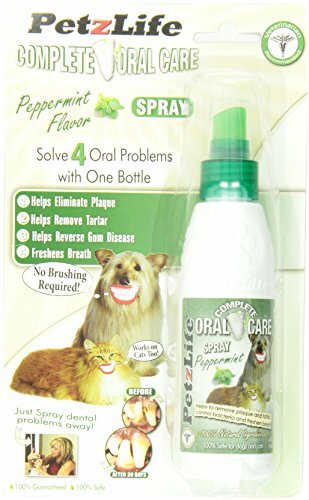 This peppermint flavored spray removes plaque and tartar from your pet's teeth--no toothbrush required! Made with all-natural, holistic ingredients, Oral Care Spray safely removes plaque and tartar, reverses oral disease, promotes healthy gums, brightens teeth and kills the bacteria that causes bad breath. When sprayed in your pet's mouth, the ingredients mix with your pet's saliva and completely coat their teeth and mouth. This process kills harmful bacteria and loosens plaque and tarter. Safe for cats and dogs of all breeds. Start your pet on the road to better oral health today. Made in the USA. Protects is an herbal product that repels fleas and other biting insects, including ticks. Does not contain any chemical insecticides and is safe for all ages. Ideal for dogs or owners who are allergic to chemical flea sprays. Simply sprinkle on the animal's food twice a day for 5-day and protect your pet for up to 2-3 month. Takes effect in as little as 5-10-day and dosage can be repeated if needed. Cleans contains herbs that aid in cleansing the body and demulcents (an agent that forms a soothing film relieving minor pain and inflammation) to help soothe the mucous membranes, thus causing no discomfort as the body naturally rids itself of unwanted parasites. This product should only be used if parasites are present. Neem oil has been used for centuries to protect animals and humans from irritation from insects and flies in a natural non-toxic way. Neem oil for dogs and cats can help with flying insects, biting insects, and mange mites. Perfectly safe for pet skin and fur. 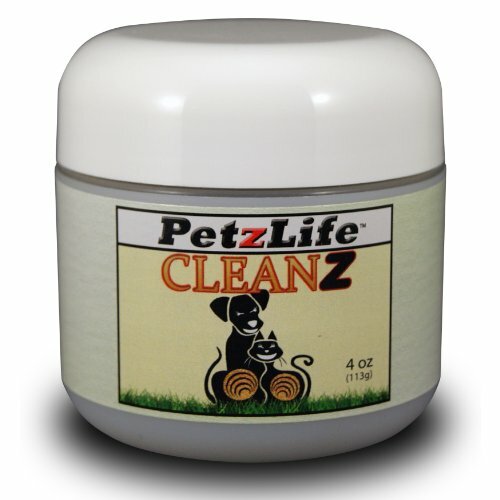 Promotes healthy skin and lustrous, problem free coat. 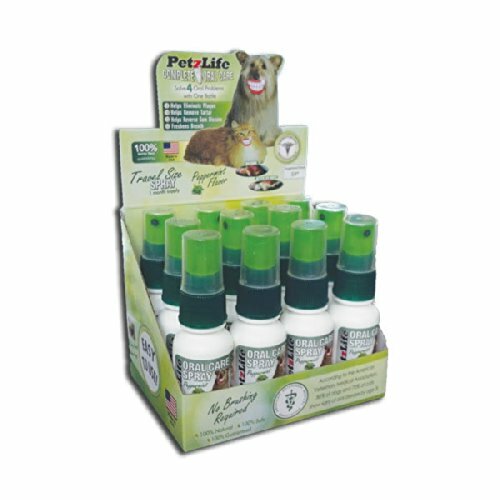 Spray directions spray a light misting of petzlife neem spray with karanja oil covering the entire coat. Spray directly on to skin around insect bites to help the inflamation and irritation. Following up apply to animal every 7 to 10 days as needed. Use on a regular basis during warmer months, and for animals that spend time outdoors in tall grass or wooded environments. Certified organic 2.2-ounce. 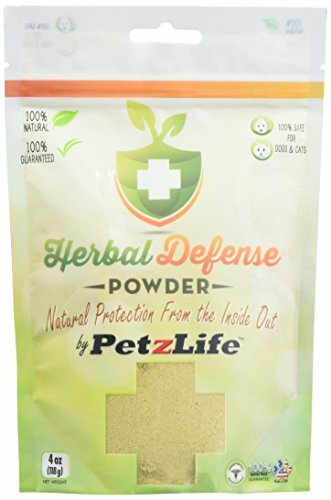 PetzLife “Complete Coat” is formulated as a topical formula to keep your pet’s coat healthy and, more importantly, to ward off insects and parasites of all types. It is all-natural and contains NO pesticides. “Complete Coat” is not for internal use. It is a topical treatment applied by being sprayed onto the pet’s coat and massaged in or brushed in to assure complete coat coverage down to the skin. Directions for use: Spray product to completely cover the entire animal, Keep out of eyes, Massage or comb product into hair or fur down to skin, Let coat dry, Try to avoid letting animal lick hair before it is dry, Apply every 2-5 weeks depending on activity. Bathless shampoo and conditioner. Simply mist your pet, gently rub into the fur and wipe clean. For best results, use a micro-fiber cloth. For dried on dirt, comb or brush your pet prior to application. An effective blend of jojoba oil, aloe vera, witch hazel and other essential oils designed to clean and condition your pet's coat. Instructions; do not use on open sores or cuts. Bath-eaze is formulated to remove dander and oils and light dirt. Lightly mist the pet with bath-eaze away from eyes and mouth as it may startle your pet. Gently rub your pet's coat with a towel until dry. Brush as needed. Ingredients; herbal extracts of chamomile, green tea, lemon grass and witch hazel in deionized water, jojoba oil, aloe vera, sweet almond oil, essential oil fragrance, natural emulsifying wax, dimethicone, cylclomethlicone, diazolldinyl urea preservative and rosemary oleoresin. Unique fast acting formula biological odor eliminator. Eliminates odors caused by urine, feces, vomit, tobacco smoke, mildew, wet dog smell, from hair, fur, carpet, rugs, furniture, clothing, shoes, autos interiors, bathrooms etc. Formulated with natural botanical extracts that contain biological surfactants saponins, polyphenols and ordenones and bio-enzymes. Instead of covering odors it binds and neutralizes odor molecules to eliminate undesirable smells. Directions; shake well before using. Spray odorz off on area or item being treated and allow for odorz off to penetrate. Wipe excess. In extreme cases more than one application may be necessary to thoroughly eliminate odor.